July 22, 2015 by Michelle M.
I read my first Susan Spann novel last year when I enjoyed another Shinobi Mystery with Blade of the Samauri. I hadn’t read the first book in the series, but that didn’t stop me from enjoying Hiro and Father Mateo as they unraveled a mystery in medieval Japan. 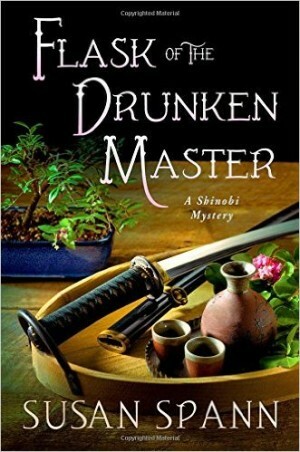 When the next book in the series was announced, I couldn’t wait to read Flask of the Drunken Master, anticipating that it would be just as much fun. There wasn’t a page that let me down. Hiro, a Shinobi assassin hired by a mysterious benefactor to protect Father Mateo, a Jesuit priest in Kyoto as he prosthelytizes, stumbles across another mystery that he cannot quite walk away from. Ginjuro, a sake brewer he frequents who he admires and trusts, is accused of murdering another sake brewer, but Hiro doesn’t believe Ginjuro could have done such a thing. With Shogun justice swift and merciless in Japan at that time, there is no time to waste. An appeal to the family of the murdered man grants them four days to find the “real” killer instead of until the afternoon before the trial. The pressure is on, but no clues seem to point to the identity of the killer. Much like Blade of the Samauri, you do not need to have read previous books to follow the intriguing adventures of Hiro as he attempts to ensure justice is done. There are references periodically to previous adventures, such as the healing hands of Father Mateo, but nothing that causes any confusion or is material to the plot. The interaction between Father Mateo and Hiro is highly entertaining, as Father Mateo has a strict code of conduct befitting a Jesuit priest from Portugal who doesn’t know or always remember the intricacies of Japanese culture and Hiro who is a samauri and sometimes displays mild frustration when Father Mateo misses the nuances, although they can also help the investigation from time to time. The book itself is a fascinating look into Kyoto in the mid 1500s, as the class structure is so rigid and behavior that would never fly anywhere today is explained, while other aspects that remain a part of Japanese culture as displayed. I love seeing the interplay amongst the classes and the subtleties that this requires. Flask of the Drunken Master includes some hinting towards the larger arc of the series and the political issues involving Kyoto. In the previous book, the Shogun “committed suicide” and a new man was named Shogun who takes immediate control but has yet to be given the official title. The undercurrents of political issues and how they affect Father Mateo and Hiro are hinted at, but it’s clear this is something that will be further developed in the next novel. I don’t need the hinting to keep me intrigued with the Shinobi Mysteries series, but it’s nice to have that subtle connection from one book to the next. Also intriguing is the increasing focus on a drunken monk Suke who also frequents Ginjiro’s teahouse and who attaches himself to Hiro. As you see him act not always in the manner he puts off as a habitually sloppy and drunken monk, you start to wonder what else he may be hiding. Whatever it is, I know there is another mystery coming, and I look forward to picking it up and renewing my acquaintance with Hiro and Father Mateo. Written by Michelle who has never been to Japan but wants to some day. See where she’s traveling (and what she’s eating while pretending she’s traveling) via her blog Honest & Truly! and follow along with her on Twitter where she is also @HonestAndTruly. I only recently started reading books set in this era and I really love it so far! This series is definitely on my TBR list.